Being a great pool player is very similar to being a samurai. Skill, strategy, and a calm zen-like center will give you the tools to be a victorious warrior – on the billiard table, that is. Oh, and did we mention to “PRACTICE, PRACTICE, PRACTICE”? These first tips are from Fran Crimi, master instructor with the Billiard Congress of America. 1. Keep your head straight. If you tilt your head, you’ll get a sideways view of the shot. It’s a very common habit, so stay aware – note the position of your head. 2. When you’re down on a shot, push your fingertips lightly into the cloth to assure that your bridge hand (the hand on the table) will not budge as your pool cue comes through to strike the cue ball. Finally, STAY firmly planted until the object ball is in the pocket. 3. Keep your back-swing smooth and slow, and keep your back hand relaxed. Don’t grab the cue stick with all of your might – it’s a pool cue, not a samurai sword! The more tense you are, the less likely the cue will travel in a straight line. 4. However, like a samurai, you DO want to survey your field of battle. Walk around. Plan your strategy. Decide where you want to position the cue ball for your next shot. 5. Develop a shot-making ritual. Make a list of all the things you want to include in your shot-making process. Then practice performing each step until it becomes your ritual. This method works great under pressure and helps keep the bad stuff from creeping in. Our next set of “Rules for Better 8-Ball” are from Larry Schwartz, two-time national team 8-ball champion. 6. Develop a good break. Making a ball on the break and playing position for another shot is the key to success; sending the cue ball flying into a pocket, or flying off the table, is NOT the key to success. 8. Recognizing key balls- that is, those balls that, once pocketed, will make it easy to break open a cluster or make it easy to get on your next shot. 9. Run out! If not, play safe. “The only time you should run out is when you are certain you will make it all the way. If you don’t think you can, play safe before pocketing any of your balls.” – Larry Schwartz. 10. Leave the 8 ball “in jail”. This means that, whenever the 8 ball is blocked by one of your balls, you MUST leave it there so your opponent cannot win the game. The only time you will shoot that ball is when YOU know YOU can run out – sink the ball, and then move right on to sinking the 8 ball. Guess what – YOU’VE WON! 11. Join a league. Competition is a big factor in improving your game. You will be able to find your weaknesses and practice on them. Also, leagues are a lot of fun! Thanks to PoolDawg.com for their help with this article. 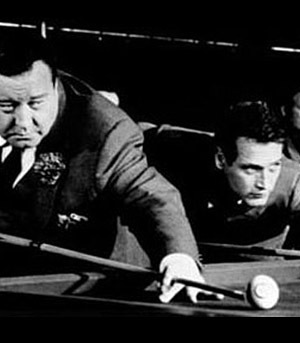 Visit PoolDawg.com for more great pool and billiards wisdom! If YOU have any pool or billiards tips and tricks to offer, we invite you to submit them for future articles on this website. Just CONTACT US with tip or trick, including any video links you might have online, and we will get back to you as soon as possible.